OM-AMPB Series non-metallic fiberglass pushbutton enclosures are designed to insulate and protect electrical controls and components in both indoor and outdoor applications and are especially well suited for higher temperatures and corrosive environments. 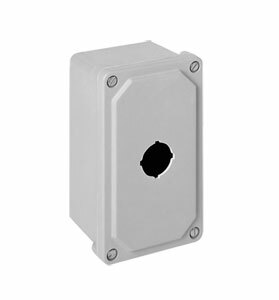 These NEMA 4X (IP66) fiberglass pushbutton enclosures feature stainless steel continuous hinge. 참고: For 22 mm button holes add “22” to the end of the model number, no additional cost. Mounting feet included on 4 button or larger models. 22 mm Indicating Lights, NEMA Type 4/4x/13 IP66 suitable for wash down environments. Non-Metallic, Fiberglass Electrical Enclosures, NEMA 4X and NEMA 3R Outdoor JIC Size Enclosures from 6x6 to 20x16"